Sarah, the first roommate to move in, got her MBA at a prestigious b-school, she just moved to Austin for a job, and she’s renting a room and driving a used, high-mileage car so that she can pay down her monstrous student loans. She’s the one I talked about earlier who’s doing what I would have done if I could start over. Well, she must have taken a class in negotiations–either that, or I’m a softie–because not only did she negotiate the monthly rent down by $100, but she also negotiated the right to park on the driveway, even though I had explicitly added a no-driveway clause to the roommate contract template I found online. I have two cars and a bike that I park in the garage, the driveway is only two lanes, and while I typically ride my motorcycle to work every day, I like the flexibility to switch it up–especially on the weekends–and I don’t want the hassle of having to move a car just to pull one of my cars out of the garage. On the first night, Sarah eschewed her parking privileges and parked on the street in front of the house, but last night she decided to leverage her parking prerogative and took to the driveway. I had to run an errand last night, and as I was pulling out of the driveway, I noticed a large puddle of oil in front of the house that hadn’t been there two days ago. I assumed that Sarah’s car was leaking oil, and not wanting a puddle of oil on my driveway, I checked under her car and confirmed via oil that was beading up around her oil pan and transmission area that it was her car. A little irritated, I went into the house and asked her to please move her car. I was thinking more about myself and the driveway and less about Sarah and her car, so I wasn’t expecting the reaction that I got when I told her about the leak. She was frustrated and angry–not about having to move her car to the street, but because she anticipated a very big, expensive car repair in her near future. I could read the dejection in her tone and in her body language; she was not happy. Then it clicked. Here she was, making sacrifices by renting a room out of a stranger’s house in a strange city and driving a very used, high-mileage car so that she pay down her student loans, and this was literally the last thing she needed. It struck me that the very same thing could happen to me. I’m making sacrifices by taking on roommates, cutting my entertainment way back, looking for extra work, and despite all that, I’m not immune to an oil leak, either. Some costs are uncontrollable. Heck, I have three vehicles, so my chances are much greater than Sarah’s that something will go wrong. And random cost hits like that are not isolated just to vehicles–my computer could break, my TV could break, the house AC could break, etc. And I’ve already been a victim to breakage–look at how I have to run-start my motorcycle these days because something on it broke and I don’t want to pay to get it fixed. I’ve never been able to feel more empathy for a black female than I did at that single moment in time. The empathy I felt for Sarah, my ability to relate to her yesterday…that’s one of the few instant (rather than delayed) benefits of this financial challenge. There’s this powerful feeling of camaraderie and unity that has the unique ability to cross boundaries. Many people have debt that they’re trying to pay off, both genders and all ages and races and walks of life. Out of the 148 comments on this blog, many are written by people who say they also have student loans and that this blog is an inspiration to them. Are these people all white, 28-year-old dudes? I’m not even three weeks into this journey, but I’ve already experienced several bouts of severe loneliness, like I’m the only guy in the world who’s making sacrifices by cutting costs and working harder to pay down debt. And out of my group of friends, that’s a true statement. But taking a broader cut of the population–taking a closer look at the people around me, and I realize that I’m far from the only person who’s doing what they have to do to get out of debt, and that it transcends all demographics. In all seriousness, good post. It reminded me of “Early Retirement Extreme” (sensational book), where the author – frugal as he is – advocates for spending on necessary maintenance under the notion that proper maintenance can negate expensive repairs/replacement later. A little bit off where your post was going, but I figured I would throw that in! Totally onboard with you 100% here, Mike. 26 year old white female.. professional turned stay at home mom. Although, I did just get a letter in the mail that my loans are being lowered by 2 percent points (to 1.38%) AND they are knocking off some of the principal. Woohoo! Good luck on the landscaping! That is AWESOME. Send some of the awesomeness my way. Thanks! I’m a black 28-year old gay dude who graduated a non top-rate business school (MBA and B.S. in Management) and is living in Dallas. Moved in with my partner from who got a job here is paying all the bills while I try to get work. Before that I was employed in NY but wanted to make more than 30k/yr in one of the more expensive areas of the country and not live with my parents in my 30s…. The biggest obstacle for me is my work history. All the jobs I’ve done have really only required a high school diploma and I tried to transition from banking to a startup as an executive assistant for 6 months, which blew up royally in my face. The CEO made a good pitch about wanting to have 200 employees and thousands of square feet of office space, but in the end I was only working 16 hours a week and burned through the 10k emergency fund I had. So I went back to banking and took a big pay cut (38 in 2009 to 29k in 2011) to do a job that didn’t challenge me. It’s only been about 2 months since I really started looking in this area and in the process have gone on 3 interviews, applied to 43 positions. I have a friend in California who I give weekly progress reports to, to hold me accountable. I owe 800 on my car, 1600 on credit card, 42000 on my student loan at 4.25%. I’m doing an income-based repayment program where payments are 115/mo instead of 300 (due to my financial hardship). Taking it step by step, knowing there will be light at the end of the tunnel. So even though the poster’s situation is much different from mine, it is inspiring to see someone else’s strategy for getting rid of debt. Take heart that you are in a good area for employment. Dallas may not seem “great”, but it is far better than many other metro areas. Telecom and IT (especially startups) are two such sectors that are fairly good in Dallas. Don’t get pigeonholed — even by choice — into an executive assistant type position. Those are often over-rated, and the pay is comparatively so-so. Please also be mindful of relying on your partner financially. Such “economic outpatient care” is likely to erode your future earning ability. Good luck. You’re in a good employment market comparatively. Stay sharp. Keep applying. Maintain strong spirits. You will land work. Just saw this reply now Mike, some 2 months later. Went on an interview yesterday, 6 so far since July . I’m not making it about pay, but the position would be twice my NY salary. Have another interview for a different company. Same industry I was in, mid-day shift, similar to NY salary, but incentive bonuses for reaching sales goals. Could add anywhere from 1800-10k onto my gross. In the grand scheme of things, I’ve applied to 111 positions. I have stopped applying for the time being, hoping the first company extends me an offer sooner than later. My partner also got a promotion at his company, which helps. Overall my mandatory expenses are relatively low from month to month. Soon to be under $500/mo once my car is paid off. I’m not overanalyzing anything though, what’s meant to be will happen. Taking it one step at a time and hoping like crazy my efforts end up working in my favor! Things are going to work out for you, dude. Have faith. 28 year old Indian female. How’s that for relatable. I got a $15K student loan outstanding, down from about $30.5K a couple of years ago. I’m actually considering doing a balance transfer on a portion of the loan to lower the interest I pay overall – currently paying 6-7%, vs the 1% cost of doing the balance transfer (usually 3% but I got an offer for 1%). I figure I can divert whatever extra I’m paying towards my loan principal towards paying off the balance transfer, and I have an year’s time to do it. Sounds like you’ve thought through it 🙂 Good luck! This is more for Sarah- go to Autozone/Advanced Auto/Napa/O’Reileys (automotive stores we have here in OK, think they should be in TX too) and get a bottle of Lucas Oil Treatment. My dad is a old-school mechanic and uses that stuff like most people use duct tape. It runs about $5-10/bottle and my car has been running on it for 2 years with no issue. If nothing else, it will buy her some time to save for a check-up. 27 white female from far away canada. the student debt loneliness is palpable, but tolerable. my car doesnt even have a working dashboard. and i learned how to change my own oil, hows that for classy? Class, class, class! (Wedding Crashers). That’s impressive. So how do you gauge your speed when you’re the only car on the road?? i used to go through construction sites with odometers as warnings to stay within the speed limit. Plus I drive a standard so that helps give a general idea. I bucked up and got a GPS app for my phone, so that now gives me an actual speed limit. its a lot more safe, a lot less fun. 21 year old Asian female with no debt at all…haha, but I love reading your posts because they still inspire me to reach my aggressive savings goals. I enjoy the psychological insights. Whenever I feel apathetic or lazy, this blog totally motivates me to keep on track with my goals. Nice, I’m glad you’re digging it. 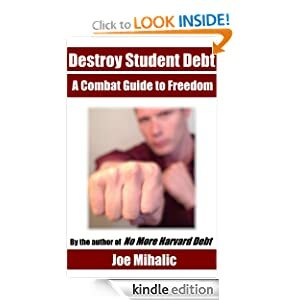 I wish I were debt-free! Bliss. I’m in my mid-late 20s. Applying to business school this year, goal to get into brand management/marketing. Trying really hard to make sure I graduate with less than $60K of student loans. Won’t be easy, but not impossible, either. There’s a blog out there by somebody who’s trying to graduate with $0 in debt. A 26 year (26 in a few weeks anyway) blk male here. I hate debt and it forces me to work at silly jobs and miss out on big opportunities. Its going down. Better believe that I am following your entire story. Any tips for me as regular guy looking to earn more? Wish I did, but it’s just the standard stuff. Focus, work hard, and sacrifice. Did you read Brandy’s mind? I would definitely hit that up, but I’ll be flying back from Michigan that day 😦 Thanks for the heads up, though. Firstly, please accept a pat on the back from me. Great job so far! You are amongst the few americans I have met who think the way you think. 2) Singledom helps- Lets face it- expenses always go up when you are in a relationship. You are going to be married for some 30-40 yrs of your life, a year of staying alone doesn’t hurt that much. 3) Gatecrashing ain’t that bad – When I was in undergrad- broke, weary, deprived of ‘rich’ food, I used to yearn for a good night with great food. What I did have was confidence. I used to dress up and walk (read gatecrash) into weddings (its very common in India ;0). Weddings that were extravagant, with tons of food and drinks. I have gatecrashed into over 30 weddings and have even had a photograph taken with the bride and the groom ( both wondering that I belong to the other side!). It kept me going through those rough days and it was in a way my attempt at living the fact that the whole world makes way for the man who knows where he is going. I say this to you, because you might feel the need for such night outs to keep you going. So don’t hold back! gatecrashing ain’t that bad! Thank you, sir! I appreciate your encouragement and tips. 1) Totally on board with all of this–reducing the complexity of materialism has more than just a financial benefit. 2) I agree that being single is cheap as long as you don’t want to date. Dating is $$$. That said, having a long-term girlfriend who supports the cause can be as equally as cheap as being single and not dating because she’ll be okay with temporary cutbacks for the sake of long-term gain. I remember when I had a girlfriend and the monthly entertainment spend would be very spiky–some months fairly high, other months super low. 3) DUDE! Wow! That’s awesome…definitely have not considered that. I know that wedding crashing used to be a bit of a fad here in the States for awhile, but that was awhile back. I really don’t think I could ever do that, but that would be awesome and would make for some incredible stories. Wedding Crashers is my all-time favorite movie, BTW. Also, awesome work on the $70k in ten months.